Recently my cousin came to visit. We drove him to the airport when he left, and since we were already in San Francisco, we decided to visit another site in the fabulous Golden Gate Park. It was the perfect thing to do on a beautifully sunny day in January. Just another reminder of why we love living in this mild climate so much! Golden Gate Park in San Francisco sprawls out over more than 1,000 acres. 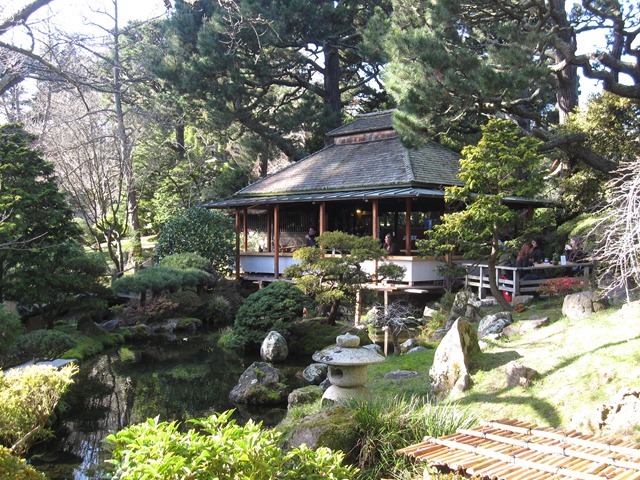 Across from the San Francisco Botanical Garden at Strybing Arboretum you will find another special spots the park has to offer – the Japanese Tea Garden. This oasis of calm offers a zen retreat from city life. As you pass through the gate into this, the oldest public Japanese garden in the United States, you’re greeted by a tall red pagoda and ducks floating on a pond. 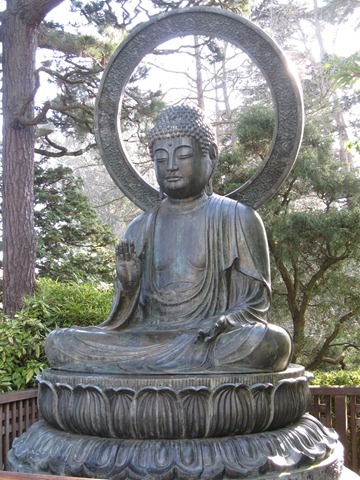 As you wander along the paved paths of the garden, you discover numerous statues and special features. Bridges, pagodas, and even Buddha fit harmoniously into the more natural elements of the gardens. At each twist and turn of the path there is something new to look at. In the center of the garden is a Japanese tea house which affords a beautiful view out over a pond. 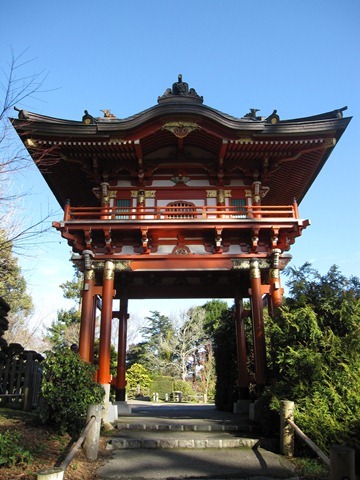 Here you can sip tea and munch on traditional Japanese treats while soaking in the calm beauty of the garden. There are both covered and uncovered spots to sit, so whether you prefer sun or shade you’re sure to be comfortable. Paved trails lead through the gardens, but stairs and narrow bridges would make having children in a carrier easier than strollers. The Japanese Tea Garden is open daily, with no holiday closures.